While this recipe is not actually a Polish one, it is an extremely popular dish in Poland. Fasolka po Bretonsku is a recipe originally from Brittany. However, in my searching for the origins of this dish, I have found that typically the non-Polish version has different ingredients. Either way, it is a delicious, inexpensive, healthy, and filling dish which can also be made vegetarian style. And it is perfect for cold winter days. Inspect and clean the Beans. I place mine in a tightly sealing plastic container with water and shake it vigorously to clean and then just pop the corner slightly to drain out the water, twice. Place in pot and add 3 times more water than Beans. Heat until boiled, cover and let stand at least one hour or overnight. Replace the water with fresh until a few inches above Beans, boil and cook until soft. Replacing the cooking water at this step helps with digestive and gas issues some people have when eating beans. In another pot, caramelize the Onion in the Smalec along with the Bacon. Add the onions and bacon to the beans, along with the ham, diced kielbasa, marjoram, Vegeta, and pepper. Cook for a few minutes to blend the flavors. Add the tomato paste and stir, which will thicken the soup. Allow to cook for another few minutes to allow the flavors to blend. Typically, Baby or Giant Lima Beans are used, although Cannelli, Navy or other beans are often used in the non-Polish versions. Also, this recipe is actually normally made with Smoked Kielbasa in the Polish versions. However, my husband did not realize that I was asking for smoked. Either way, it is absolutely delicious! Even my father, who grew up with this in Poland, said that it smelled and tasted exactly like my Babcia's homemade Fasolka po Bretonsku, which I know no higher compliment. You might also be wondering, "Will my kids eat this?" My five year old and one year old inhale this. Yes, your kids will eat this. You might have to convince picky eaters to give it one bite to at least try, but once they do, they will love it. i have made this without the tomato paste and it is still really good!! My husband would love this! Thanks, I'll have to give it a try!!! Sounds delicious! Reminds me of some southern cooking I had growing up. 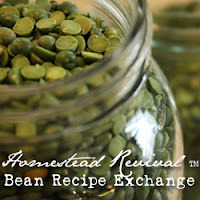 Thanks for linking up to the Bean Recipe Exchange! Lol.. my boyfriend makes this!! I'm polish and I didn't even know other nations made this, He fully made fasola po Bretonsku.